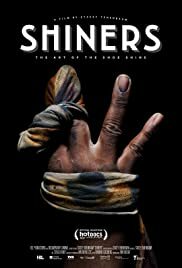 SHINERS is a feel good, occasionally over manipulative documentary on shoe shiners. Writer/director Tenenbaum ensures the audience is constantly kept up with their uplifted emotions. The film is narrated by the shoe shiners themselves, who dish out their values on life. What they say is occasionally insightful, though one must always take what they say with a pinch of salt. They might be biased and slanted in putting in their two cents worth, though what they say may be funny and insightful. Tenenbaum loos at shoe shiners around the world from the United States to Canada to as far as Bolivia and Japan. The film opens with shoe shiner Don from New York City, the U.S. “I plan my route,” he proudly admits while smooth talking, sometimes insulting the passersby while he shines his customers’ shoes on his contraception. Ron is funny enough to entertain the audience, in fact providing the most laughs of all the shoe shiners on display in the film. On a more serous note are two shiners from La Paz, in Bolivia. Balloo covers his face, as do most shiners in La Paz, afraid of what their friends will think while seeing them doing this low profession. Sylvia, on the other hand, is proud and carries her baby and does the job with her face uncovered. She brings dignity to her job as well as the film. Another shiner wears a suit and charges $25 per job, which could take as long as an hour. Yuya in Tokyo, polishes shoes in a high end establishment. As does Kevin and Company in San Francisco in another high end store. Ramiz in Sarajevo is a man who talks about taking over his father’s shoe shoe business. His family’s business is recognized by the city’s mayor and the entire town. Toronto, Canada is not forgotten when Tenembaum introduces Vincent in his haircutting place. Vincent suffers from a mental and physical disability (he is also gay and knits) but the job gives him a life and dignity. Credit goes to Tenembaum for an excellent cross-section selection of charismatic shoe shiners from all over the world. What they share is their love for their profession which all of them are very good at. Personally, shoe shining is a formidable task. Being in the army, shining ones own army boots takes days, care, patience and skill. The lumpy boots have to be burnt smooth with a heating iron before they can be polished with a cloth, water and and black kiwi. It was an art and one that I myself could not master. SHINERS premiered in Toronto during the Hot Docs festival. SHINERS might not be the best movie of the year, being small in production (and less than 90 minutes), values and limited in scope by its subject, but it still comes close to being as mighty uplifting as getting a bright new shoe shine.